This is my favorite soup to make during the “winter” (in quotes because the winter season is debatable in Arizona). 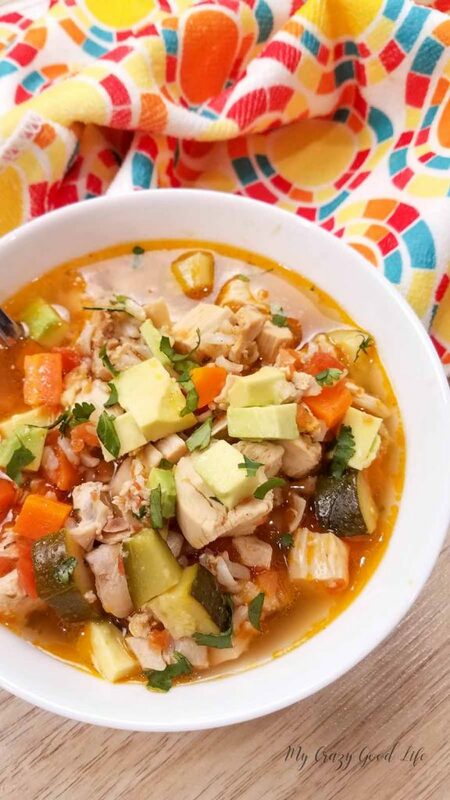 Making this rotisserie chicken soup with salsa is quick and easy, bonus points because the whole family loves it too! 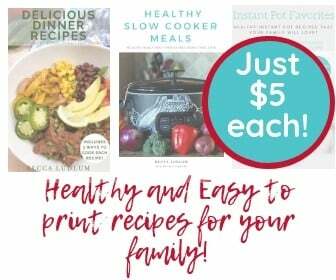 The great news is that you can make this recipe three ways: in the Instant Pot, in your Crockpot, or with the tried and true stovetop method. You know I love finding ways to make recipes easier and less intensive. Break out the Crockpot or the Instant Pot to take the watching and stirring out of this tasty recipe! 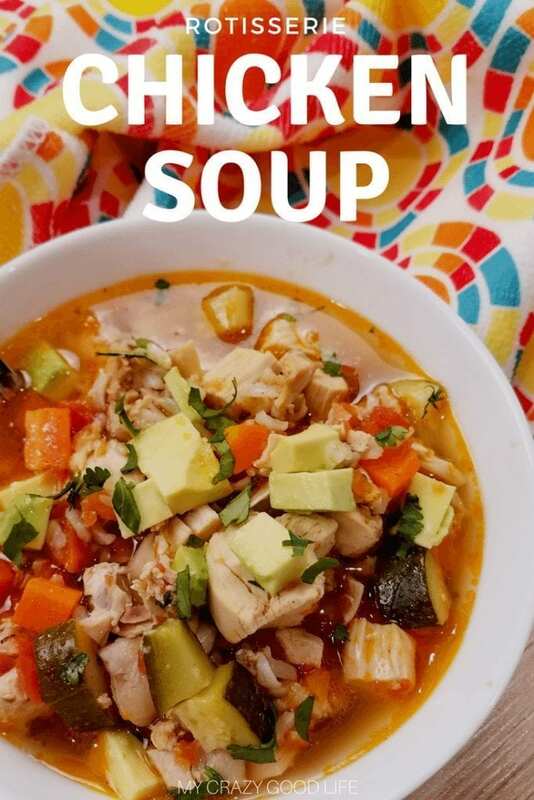 Perfect for meal prep too, you can make a batch of this tasty soup and reheat it all week long. Make sure to add your toppings fresh each time or they’ll get soggy! I can’t lie, I love easy recipes. Delicious recipes are fantastic but if they’re too complicated I won’t want to make them. 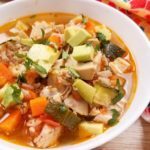 This homemade chicken soup with salsa is so easy. If you want to make it even easier you can use this chicken for meal prep recipe to prep your chicken ahead of time. 1) Pull the meat from the rotisserie chicken and chop it into bite sized pieces. 3) Pour the rest of the ingredients to the Instant Pot. Close the lid and turn the pressure valve to sealing. 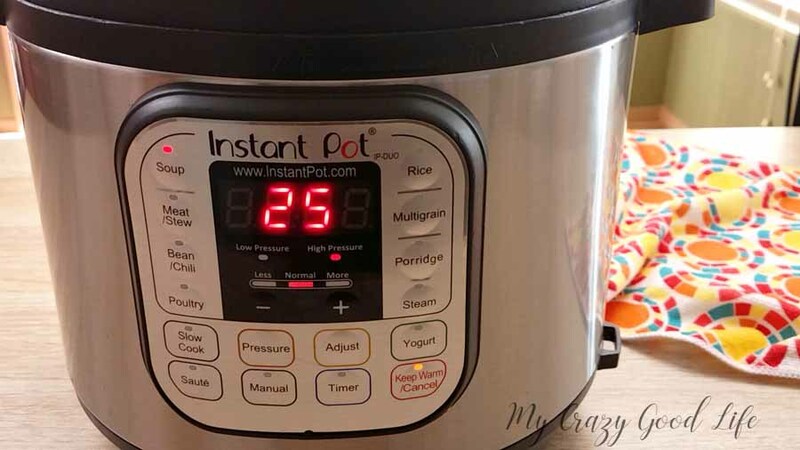 Remember, dry rice for Instant Pot cooking! 4) Cook on high pressure using the soup setting for 25 minutes. When the Instant Pot is done cooking let the pressure release naturally or release the pressure by turning the valve a little then closing it again. This will release a little pressure at a time and prevent the soup from shooting out of the valve. 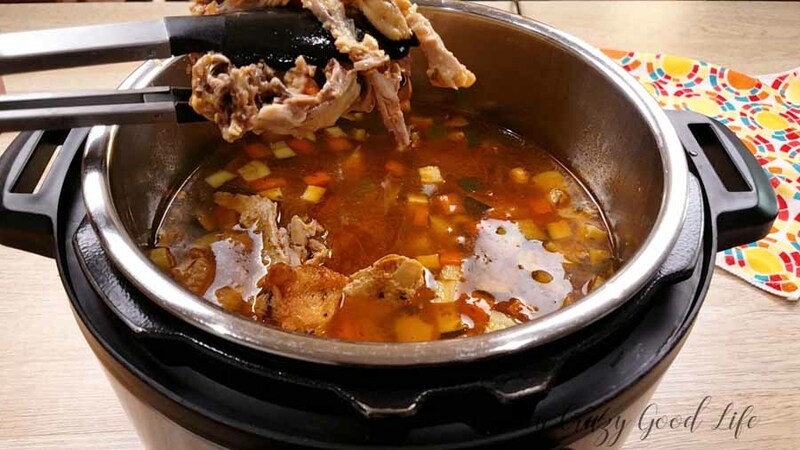 5) Remove the bone and skin from the soup the serve. Garnish with chopped avocado, cilantro, and/or tortilla strips and cheese. 2) Add the meat, bones, and skin to the slow cooker. I grouped the bones and skin on one size of the slow cooker so that they were easier to remove later. 3) Pour the rest of the ingredients to the slow cooker. 4) Place the lid on the slow cooker. Cook the soup on high heat for 2-3 hours or low heat for 4-6 hours. 5) When it’s time to eat remove the bone and skin from the soup the serve. Garnish with chopped avocado, cilantro, and/or tortilla strips and cheese. 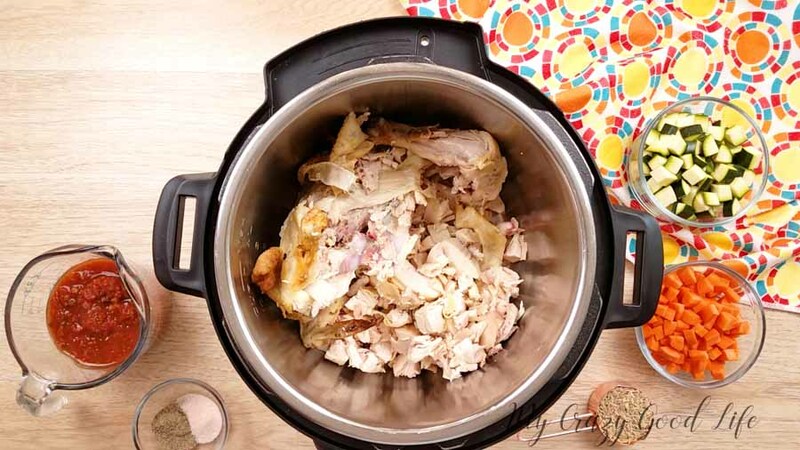 You can skip steps 3 &4 if you are using the crockpot chicken for meal prep recipe that I linked above! In all reality you could skip right to adding the rice if you make the crockpot chicken. Just make sure to add your salsa into the mix for the simmering process! 1) Pour the chicken stock and salsa into a stock pot on low heat. 3) Pull the chicken off the bone. I put it all on a cutting board and then cut it into smaller pieces before putting it into the pot. A huge step that I used to skip (because it’s icky) is putting the skin, drumsticks, and wings into the pot. Don’t skip that step. It adds a lot of moisture and taste, and you’re going to take out all the yucky stuff before you eat the soup. Trust me on this one. Go ahead. Close your eyes and put the drumsticks and wings in. 4) Add the salt and pepper, and the veggies when theyíre done. 6) Let it simmer (slow boil) on the stove for an hour. Or two. Or three. 8) Garnish with chopped avocado, flour tortilla strips, or both! This is my favorite soup to make during the "winter" (in quotes because the winter season is debatable in Arizona). 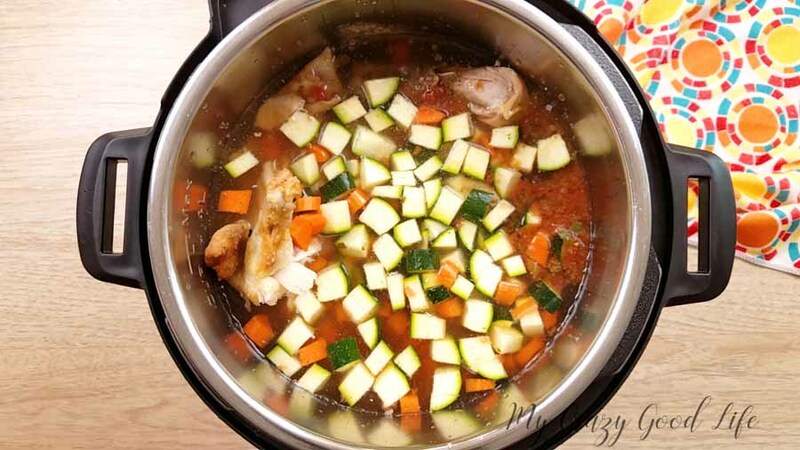 Making this rotisserie chicken soup with salsa is quick and easy, bonus points because the whole family loves it too! 64 ounces low sodium chicken stock or if you're fancy and you make your own, 64 oz. Pull the meat from the rotisserie chicken and chop it into bite sized pieces. Add the meat, bones, and skin to the Instant Pot. I grouped the bones and skin on one size of the Instant Pot so that they were easier to remove later. Pour the rest of the ingredients to the Instant Pot. Close the lid and turn the pressure valve to sealing. Remember to use dry rice when cooking in the Instant Pot. Cook on high pressure using the soup setting for 25 minutes. When the Instant Pot is done cooking let the pressure release naturally or release the pressure by turning the valve a little then closing it again. This will release a little pressure at a time and prevent the soup from shooting out of the valve. Remove the bone and skin from the soup the serve. Garnish with chopped avocado, cilantro, and/or tortilla strips and cheese. Pour the chicken stock and salsa into a stock pot on low heat. Pull the chicken off the bone. I put it all on a cutting board and then cut it into smaller pieces before putting it into the pot. A huge step that I used to skip (because it's icky) is putting the skin, drumsticks, and wings into the pot. Don't skip that step. It adds a lot of moisture and taste, and you're going to take out all the yucky stuff before you eat the soup. Trust me on this one. Go ahead. Close your eyes and put the drumsticks and wings in. Add the salt and pepper, and the veggies when they're done. Add the rice. Cooked rice is needed here! Let it simmer (slow boil) on the stove for an hour. Or two. Or three. Garnish with chopped avocado, flour tortilla strips, or both! Add the meat, bones, and skin to the slow cooker. I grouped the bones and skin on one size of the slow cooker so that they were easier to remove later. Pour the rest of the ingredients to the slow cooker. Cooked rice is fine here as well! Place the lid on the slow cooker. Cook the soup on high heat for 2-3 hours or low heat for 4-6 hours. When it's time to eat remove the bone and skin from the soup the serve. Garnish with chopped avocado, cilantro, and/or tortilla strips and cheese. Weight Watchers Freestyle Smart Points: 1 point per serving using chicken breast without skin. Could you please tell me what containers you use to portion this recipe? How it relates to the 21 Day Fix? But what about the brown rice? What number of yellows do you count that as? Depending on how much brown rice you add, you could could it as 1/4 or 1/2 yellow container. Hello! Does the rice go in cooked and then I simmer it for a couple hours? I just want to make sure I’m clear. I cannot wait to try this tonight!! It is cold here in North Florida. Hello! I use the Minute Rice and put it in for a few hours, or if I need it faster I use cooked rice. It’s chilly here in Arizona too! I hope this warms you up! The recipe says cooked rice. Is it supposed to be uncooked? I can’t imagine only a quarter cup of cooked rice proportioned with the larger quantities of everything else. You can definitely change the amount to what works best for you! Great soup! I flipped the order of instructions. I put only the stock in the pot first and the “yucky” chicken bones and skin and let them cook while I finished cutting up the chicken and cooking the veggies. Then I just dumped it through a strainer, poured the stock back in the pot, and finished the recipe. I am cooking this now. Since it serves 6 I added 3 yellow container portions of cooked rice. That way, when I divide it I have 1/2 yellow container per serving. This worked best since I wasn’t planning on adding cheese or tortilla strips to my soup. I will add avocado as a topping and probably squirt some lemon juice into it (I love lemon in all my broth soups). I like that the salsa kind of takes the place of having to chop onion and garlic. It smells heavenly up in here. Side note. . .when reading this recipe there is a tendency to just take the breast meat. Harvest all the meat. Grocery store rotisserie chickens are small. If you get a Sams Club or Costco roasted chicken, feel free to just use the breast. Those things are HUGE. Thank you for this great recipe. I really enjoyed it. I substituted the brown rice with hulled barley. I had cooked a couple of chickens in my IP yesterday and planned to use one of them to make this recipe. So glad it turned out well. I’m so glad you liked it! This is one of our favorites! Hi, I made this soup in my instant pot tonite and I just wanted to tell you how much I love it!! It has so much flavor. 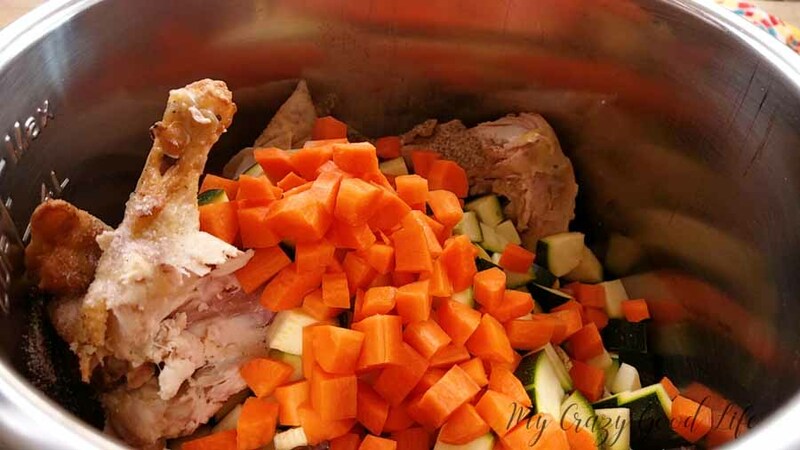 Even my dogs loved it, i let them lick the bowl…my only problem, my rotisserie chicken carcass fell apart during cooking and the bones ended up everywhere. Any tips or suggestions for future? I definitely am making this again! Yay!! This makes me so happy! They have bags you can buy, mesh or cheesecloth ones, that contain the bones–I’d try that!